Written In Torment are a band from the United Kingdom that has been featured before in this zine and plays an occult form of black metal and this is a review of their 2017 album "Si Vis Pacem, Para Bellum" which was released by Sleaszy Rider Records. A very fast and raw siund along with a great amount of blast beats, tremolo picking and grim black metal screams start off the album and the songs also bring in a great mixture of slow, mid paced and fast parts along with a great portion of the tracks being very long and epic in length. When solos and leads are utilized they are done in a very dark yet melodic fashion while the riffs also use a decent amount of melody along with some atmospheric synths also being added into certain sections of the recording and all of the musical instruments have a very powerful sound to them. Some songs also bring in a small amouint of spoken word parts and the music also brings in a lot of second wave infleunces while also sounding very modern at the same time and melodic vocals are also used briefly and one track also brings in a brief use of movie samples and some riffs also add in a touch of traditional metal and thrash along with some solos that have a technical death metal edge to them. Written In Torment creates another recording that brings in a raw style of occult black metal while also mixing in infleunces from other genres of metal to take their sound to a different level, the production sounds very professional while the lyrics cover Occultism and Human Suffering themes. 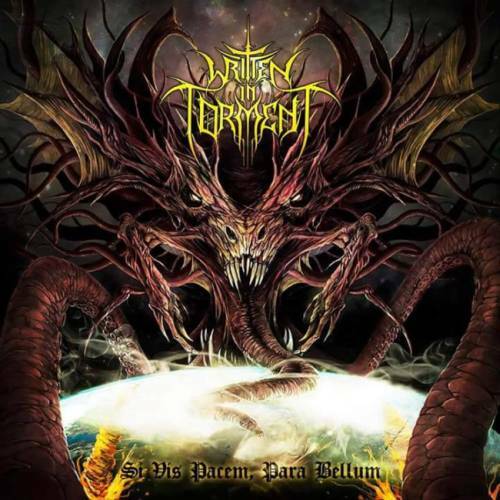 In my opinion this is another great sounding recording from Written In Torment and if you are a fan of occult black metql, you should check out this album. RECOMMENDED TRACKS INCLUDE "Spear Of Destiny" "Worthless Child Race" and "Ouroboros, Thou Art Levithan". 8 out of 10.